From June 23rd to June 26th, Marseille will host the next step of the World Cup Skateboarding (WCS) series, four days of pro bowl, pool and vert contest in one of the best renowned bowl in the world. 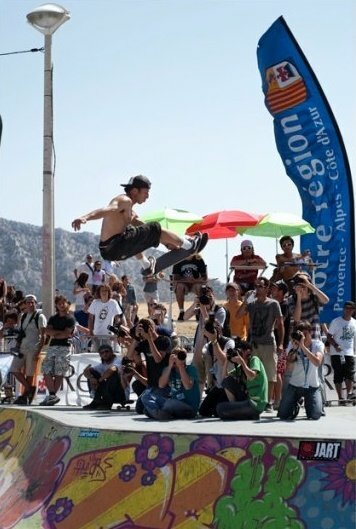 After more than 50,000 visitors last year and for the fourth consecutive year, the Prado Bowl will receive the Orange Marseille freestyle cup, presented by Sony Ericsson, the unmissable freestyle outdoor sports and the only French leg of the World Cup Skateboarding. The venue is organized by Sylvain and Benoit Moussilmani, pro windsurfers and 2010 World Champion. The Marseille Bowl, one of the World's Best Skatepark will be the place of rendezvous of the greatest riders of the circuit by hosting for the second consecutive year, the only French leg of the "World Cup Skateboarding" category Senior and Masters. To open the international stage, the Orange Skateboard Cup will allow pro and local amateurs to compete for 2 days and get the right to participate in the pro competition (3 wild cards available). The expected competition is from Friday 24 to Sunday, June 26 with an Awards Ceremony Sunday, June 26 at 19pm in the Village. 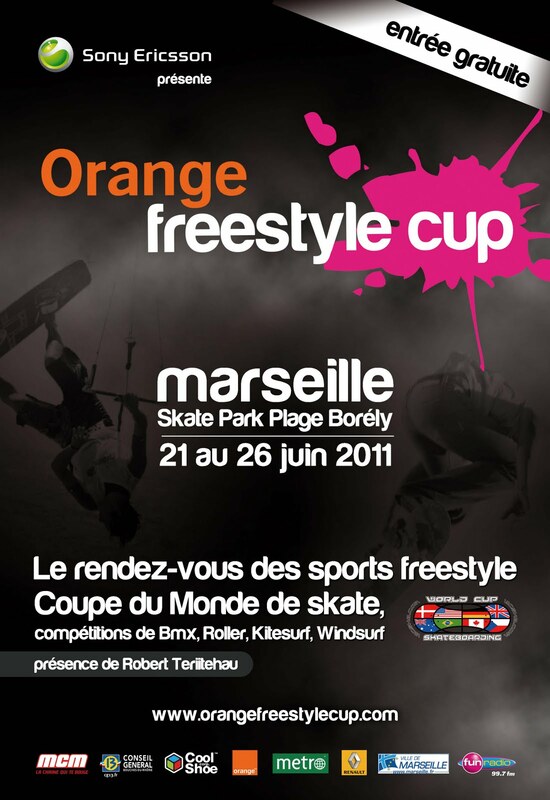 The Orange skateboarding cup is a state of sportsmanship and friendly, associated with urban culture and the world of freestyle. Throughout the week, days and evenings are punctuated by events allowing the public to discover and participate in environmental "freestyle" in its many facets! Given the success of the 2010 edition of the Sunset Music Festival, organizers will offer, throughout the week, an intense music program in the village official event, feet in the sand, facing the sea and head in the stars. First night scheduled for June 21, Day of Music and watch the competition, with the presence of an international artist, nearly 3,000 people are expected each night in the village. Like every year, the Prado bowl will host for 72H a team of fifteen European graffiti artists with a mission to prepare for the arrival of international riders. On a theme imposed by the organizers, teams will have to offer their inception in record time so that the site is ready for the official opening of the World Cup Skateboarding. The theme this year: 2011 OFC course, but also in 6 sports competition and Marseille! 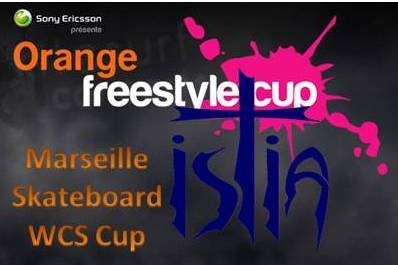 According to twins Benedict and Sylvain Moussilmani from Marseille and founders and organizers of the competition, the 4th edition of the Orange Skateboarding Cup reinforces the idea that the craze for sports freestyle is on the rise. "Since the first edition, we are pleased to see how the audience follows, still more, these days: it's what drives us to offer new competition in the presence of male but also female riders. We follow pro riders and are pleased to participate in this unique event which is today the appointment of freestyle in France. For proof, Marseille is the only stage this year's French World Cup Skateboarding! Robert Teriitehau Windsurfing legend, World Indoor champion, joins the explosive cocktail by actively participating in demonstrations of kitesurfing and windsurfing. You can count on him and all others! " isTia is covering the event before during and after the contest with Patrick Lozano, ex French pro skateboarder and Benoit Canivez famous French bowl rider and one of the bowl’s judges.